Aaron Aaronsohn was one of the most extraordinary figures in the early struggle to create a homeland for the Jewish people. Brought to Palestine at age five, as a young man Aaronsohn was a rugged adventurer who became convinced during years of solo explorations that water should govern the region's fate. He compiled both the area's first detailed water maps and a plan for Palestine's national borders that predicted and--in its insistence on partnership between Arabs and Jews--might have prevented the decades of conflict to come. In World War I, he ran a spy network with his sister, Sarah, that enabled the British to capture Jerusalem but also made him the rival of his colleague T.E. Lawrence. There is evidence that beautiful, rebellious Sarah, who died tragically in 1917, was the only woman the enigmatic Lawrence ever loved. Ultimately, Aaron Aaronsohn also paid for his devotion to the new nation with his life. 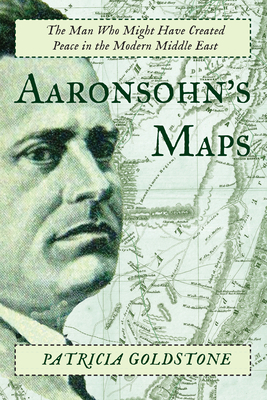 A history that speaks directly to the present, Aaronsohn's Maps reveals for the first time Aaronsohn's key role in establishing Israel and the enduring importance of Aaronsohn's maps in Middle Eastern politics today. Patricia Goldstone has been a reporter for the "Los Angeles Times" and has written for the "Washington Post," "Maclean's," and the Economist Intelligence Unit, among others. She is the author of "Making the World Safe for Tourism" (Yale University Press, 2001), and is an award-winning playwright as well. She lives in New York.